Prunus subspecies. (Rosaceae). The plums of today have derived from a number of species over thousands fo years. In Europe, including Britain, the sloe or blackthorn (Prunus spinosa) and the bullace (Prunus institia) are widespread, while the cherry or plum myrobalan (Prunus cerasifera) is native of southwest Russia bordering on the Caspian Sea. The plum is grown in Britain and Europe today is now classified as Prunus domestica and is considered to have arisen, in its many forms (both shape and colour) from hybridisation between Prunus cerasifera and Prunus spinosa in southwest Asia/southeast Europe, whence the various selections were gradually spread and introduced over many centuries in a westerly and northwesterly direction. (1) Prunus domestica, with wide variations in shape, size and colour. Several distinct types are distinguishable, including Reine Claude or Greengage types, with round fruits, green with cerise marblings and with a rich, sweet flavour; Transparent Gage type with partially transparent skins through which the outline of the stone is visible; Prune types, purple-skinned and usually with a high sugar content and an affinity to successful drying. Many Prunus domestica cultivars are grown in Europe, the US, Australia, New Zealand and South Africa, especially in the cooler areas. (2) Damson. 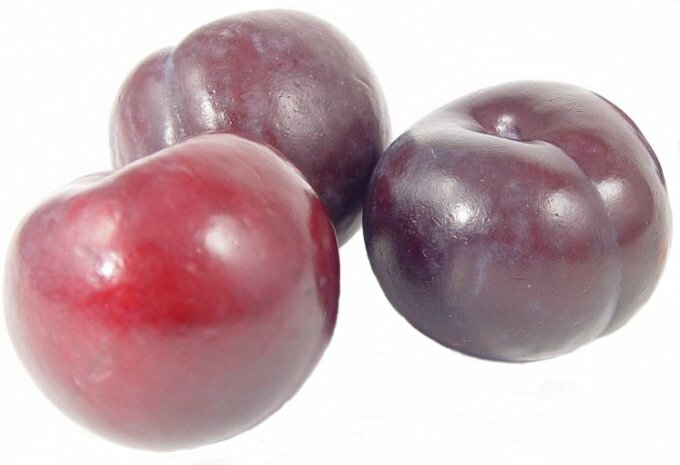 Selections from Prunus institia with small purple-black, oval, often necked fruits, initially astringent and acid but often with a richer, sweeter flavour when fully ripe. Typically listed as ‘Damson’; ‘Merryweather’ is a widely grown cultivar; see DAMSONS. (3) Cherry plums. Selections from Prunus cerasifera both red and yellow fruited (and black in Southwest Asia) of more indifferent cooking quality. The trees flower very early (late winter-early spring) and selections are grown more widely in Britain for foliage effect (e.g. Prunus cerasifera ‘Pissardii’) and as rootstocks (e.g. ‘Myrobalan B’) than for fruiting, since cropping is minimal because of frost. (4) The salicine or triflora plum. Selections from Prunus triflora or Japanese plum, these are widely grown in Japan, southern Europe, South Africa and California but, like cherry plums, flower too early for successful fruiting in northern Europe. Fruits are round and, among modern cultivars, large; in colour they are red, yellow and purple. Other minor groups are identifiable, for instance the Mirabelle plums of France, which are selections of bullace (Prunus institia) with black or green-red fruits. They mostly have cultivar names prefixed with ‘Mirabelle’, as in ‘Mirabelle de Metz’. Another group is also known among horticulturalists as gage-type plums – cultivars that are not greengages but which have particularly rich-flavoured flesh, e.g. ‘Jefferson’ and ‘Denniston’s Superb’. In North America the native species Prunus americana, Prunus angustifolia, Prunus munsoniana, Prunus nigra and Prunus subcordata have given rise to a number of cultivars that are particularly suited to a harsher (cold and heat) conditions. They also impart disease resistance. These include: ‘Dandy’ and ‘South Dakota’ (green-skinned), and ‘Grenville’, ‘Patterson’s Pride’ and ‘Pembina’ (red/purple skinned). However, they are of indifferent quality and the European and Japanese plums offer a far greater range of quality. Some cultivars have resulted from crosses between the American and Japanese plums to give increased hardiness and disease-resistance. The Romans were responsible for introducing different types of plum into Britain. From these, seedlings arose in the wild increasing the potential for further development, with time, in association with the indigenous populations of Prunus institia and Prunus spinosa. However, until the 16th century plums were dried and preserved rather than eaten as fresh fruit. With the enthusiasm for fruit-growing that flourished during the reign of Henry VIII, new and richly flavoured cultivars were introduced from the Continent, particularly France, with some fine prune types from the Balkans. By the early 1700’s many varieties were being propagated by nurserymen and the famous ‘Coe’s Golden Drop’ was bred towards the end of the century. It arose from a stone of ‘Green Gage’, a cultivar that had reputedly originated in Armenia and had been introduced to Italy, then to France and so to Britain. In France it was known as ‘Reine Claude’ (hence the Reine Claude type in classification) and is still widely grown there. The name ‘Green Gage’ arose because a consignment of trees sent by John Gage, a priest living near Paris early in the century, was received by his brother in Suffolk with the label missing from the ‘Reine Claude’ trees. He then proceeded to name the cultivar ‘Green Gage’ after his brother. By the early 19th century many excellent cultivars existed in Britain and the Horticultural Society listed 281 in its collection, though many were synonyms and more were still worthless. No major or organised progress in the introduction of new cultivars occurred until, under the influence of the Horticultural Society and of Thomas Andrew Knight, the leading nurserymen Thomas Rivers and Thomas Laxton embarked on what was to become a long and famous association with fruit and fruit breeding. Their ascendancy coincided with the period of the Victorian kitchen garden, for which new cultivars were constantly sought, and this situation continued until the final decline of the large estates after World War II. Numerous fine cultivars were introduced during this period, some of which are still widely listed today, and concurrently cultivars reached other parts of the world. Plums are widely grown in gardens and some cultivars (e.g. ‘Victoria’) will usually succeed in all but the harshest areas. Commercial orchards have long been in steady decline due largely to greatly reduced interest in preserved and canned plums, these being replaced by home-frozen or imported samples of many other fruits. The commercial production of high-quality dessert plums is difficult because of Britain’s uncertain climate and equally because the choicest varieties were bred for the Victorian walled gardens, not for open orchards. There is, however, an awakening interest in home production of choicer plums, aided by a major breeding programme which began at Long Ashton Research Station in 1968 and was transferred to East Malling Research Station in 1985. The potential for plums depends on a sunny but sheltered site and reasonable freedom from spring frosts to encourage good pollination and fruit-set. In Britain, southern and particularly the drier southeast counties give success with a wider range of cultivars including gages, but humidity and rain during the ripening period often causes premature skin splitting and rotting in choicer kinds. Wall culture is advisable for consistently good results with the best gages and gage types, which naturally flourish best in rather warmer climates. Most soils are suitable but highly calcareous and badly drained conditions are to be avoided. Longevity is often reduced on very dry, sandy soils unless consistently good husbandry is effected. A pH of 6.0-6.5 should be aimed for; readings on the alkaline side may give rise to lime-induced chlorosis. Rootstocks currently used are predominantly ‘St. Julien A’ (moderately vigorous) and ‘Pixy’ (moderately dwarfing). The former is a selection from the many forms of ‘St. Julien’ grown from seed in France; ‘Pixy’ is a recent introduction and is a selection from seedlings of ‘St. Julien d’Orleans’. Other older rootstocks still occasionally used are ‘Myrobalan B’ and ‘Brompton’ (both vigorous) while others of long standing, such as ‘Mussel’, ‘Common Plum’ and ‘Pershore’ (moderately vigorous) have lapsed for various reasons, e.g. difficulty in suckering (‘Mussel’), with propagation and with compatibility. ‘St. Julien A’ and ‘Pixy’ have the advantages of giving moderate and small-sized trees respectively that quickly commence cropping, and universal compatibility. The production of rootstocks is either by layering or by hardwood cuttings in protected bins with periods of controlled temperature at the cutting base. A few varieties, such as ‘Pershore’, will root readily from hardwood cuttings and thrive successfully on their own roots. In the US, seedling ‘Myrobalan’ is the normal rootstock but where incompatibility occurs (e.g. with ‘Stanley’) alternative clonal rootstocks are called for, for instance ‘Brompton’ or ‘St. Julien’. Peach stocks are sometimes used for the Japanese plums. In Australia the ‘Buck’ plum rootstock is recommended for European plums and ‘Myrobalan’ or ‘Marianne’ for Japanese types. There is a reasonable range of cultivars available and where conditions are conducive to regular cropping, a succession of fruiting would be possible from mid-summer through to mid-autumn, varying according to weather pattern. However, the number of cultivars that will reliably set and sustain good crops on a regular basis in the UK is limited; the majority of fine-flavoured cultivars (e.g. ‘Green Gage’, ‘Jefferson’, ‘Coe’s Golden Drop’) are generally uncertain in cropping unless given suitable wall space. In the US, the European plums are suited especially to New York State and East Coast regions, while the Japanese types are preferred to the West Coast. Similarly, in Australia and South Africa the European cultivars are favoured in the cooler areas. The Japanese types flower earlier and need warmer, frost-free early spring conditions. 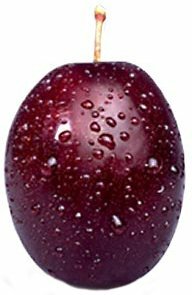 Damsons and cherry plums are found only on a limited scale in the UK but prunes are grown in quantity in certain areas of France, the Balkans, California and Australia, where dry, sunny conditions aid the harvesting and drying of this fruit. 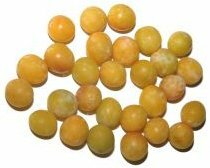 Besides the cultivars already mentioned the following are recommended: European plums (green/yellow-skinned) ‘Alabaster’, ‘Reine Claude de Bavay’, ‘Yellow Egg’; (red/purple-skinned) ‘Empress’, ‘Mount Royal’, ‘Peach’, ‘Seneca’. Japanese plums (green/yellow-skinned). ‘Early Golden’, ‘Howard Miracle’, ‘Kelsey’, ‘La Crescent’, ‘Ptitsin’, ‘Shiro’, ‘Wickson’; (red/purple-skinned) ‘Abundance’, ‘Beauty’, ‘Bruce’, ‘Burbank’, ‘Elephant’s Heart’, ‘Friar’, ‘Mariposa’, ‘Morris’, ‘Ozark Premier’, ‘Pipestone’, ‘Santa Rosa’, ‘Satsuma’, ‘Superior’, ‘Toka’, ‘Waneta’. Prune cultivars ‘Brooks’, ‘Early Italian’, ‘Italian’, ‘Prune d’Agen’, ‘Stanley’. 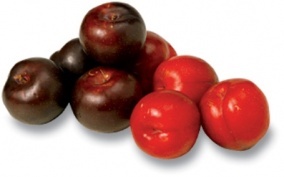 Cherry plums ‘Compass’, ‘Manor’, ‘Opata’, ‘Sapa’, ‘Sapata’. In the UK, where EMLA status material is specified, this is the best guarantee with both rootstock and scion having originated from virus-tested stock under a scheme initiated by East Malling and Long Ashton (hence EMLA). 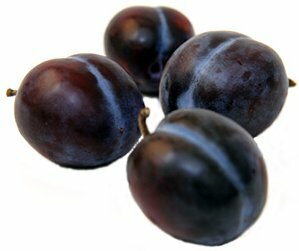 Fertility in European plums (Prunus domestica) falls into three distinct categories. Class A: cultivars entirely failing to set with their own pollen; Class B: cultivars setting a poor crop (2-5%) with their own pollen; Class C: cultivars setting a full crop with their own pollen. Cultivars in Classes A and B require at least one other suitable cultivar close by as a pollen source for cross-pollination. There are isolated cases of unsuitable combinations because of incompatibility but usually, provided flowering of the two or more cultivars overlaps adequately, and given fair weather, then cross-pollination and subsequent crop-set should result. The necessity for the presence of bees and other pollinating insects is paramount and sheltered conditions are greatly conducive to their activity, particularly as plums flower early in spring when cold winds can predominate. The Japanese plums (Prunus salicina) mostly require suitable combinations for cross-pollination; they will not cross-pollinate with European plums or vice-versa. Hand-pollination with a soft camel-hair brush or cotton wool is advantageous if good weather conditions are lacking. The introduction of less vigorous rootstocks producing smaller trees has greatly increased the possibility of successful garden cultivation of the plum. The standard and half-sized trees with their need for space and the difficulties they present for pruning, spraying and picking should no longer be a choice unless for some special circumstance. Tree types best suited for open garden culture are the bush and the pyramid. A variation of the latter is the spindle and for wall culture the fan is the best option (plums do not respond readily to other forms such as the cordon or espalier employed for apples and pears). Equally, the smaller tree is particularly attractive for the commercial orchard and modern plantings reflect this with the use of small bush or spindle-type trees. In all cases, steady production of young growth is essential since this bears the finest fruit, although a good proportion is also produced on older wood. In the US and South Africa large vase-shaped bushes are favoured, sometimes also centre-leader trees. In Australia the vase is also popular, and the espalier and intensive systems such as Bouché Thomas are also used. Planting is best done in late autumn to early winter and no later than late winter if possible, as growth commences early. The ground must be weed-free. All newly planted trees should be suitably staked and tied, permanently if on dwarfing ‘Pixy’ rootstock. Planting distances in gardens should be approximately 3.5m for bushes, 2.75m for spindles, 3m for pyramids; in orchards 3.5-5.25m should be allowed between rows (the greater distance for the more vigorous stocks and cultivars) and machinery requirements also need consideration. Fan-trained trees require a wall or fence height of at least 1.75m and a span of 3m minimum with at least 3m between trees, rather more if on ‘St. Julien’ rootstock. Plums are best grown in clean, cultivated ground, although commercially a permanent grass sward as for apples is often established. In town gardens special attention to feeding and irrigation is essential, especially to trees on more dwarfing rootstocks. Irrigation is always essential in hot dry regions. The formative pruning of trees is most important to ensure an even distribution of well-angled branches. This reduces the risk of serious breakages under the weight of crop or windy conditions. The plum is very prone (particularly in certain cultivars) to two serious diseases – silver leaf and bacterial canker – that gain entry predominantly through injuries and pruning wounds. Thus branch formation should be as strong as possible; also pruning of young trees should be delayed until late spring when the risk of infection through pruning wounds is less than in winter. The bush is developed ideally from a feathered maiden cut to 76cm. Feathers are removed from the basal 45cm of stem. Between about 45cm and 75cm three or four well-spaced laterals should be selected and shortened by two-thirds of their length, these radiating out like the spokes of a wheel. It is important that the main branches should originate over a length of the trunk rather than close together to minimise damage from any major breakage. In subsequent years, further suitably placed branch leaders are selected and shortened by about one-third, any badly placed strong growths being removed completely. The pyramid is also built from a feathered maiden which is cut to a good bud at 1.5m. Any feathers below 45cm are removed; those remaining under 30cm in length are left untouched, while any longer ones are reduced by half. Subsequently young growth is summer-pruned once shoots are hardened in their lower half (pruning too early will only result in the formation of unwanted secondary growths) by cutting all maiden lateral and branch leaders to 20cm and sub-laterals to 15cm. The central leader is not summer-pruned, but is shortened by two-thirds the following April. This treatment is repeated annually, but with the adjustment that once tree height has reached about 2.5m the shortening of the central stem is delayed until early May, when it should be reduced to 2.5m or to any other predetermined height. The formation of the spindle closely follows that of the pyramid initially but with some important differences. Retained laterals are left unpruned and summer pruning of new growth is not practised. The tree is in effect left to develop freely with branches radiating out from the trunk. The fan-shaped tree is preferably built up from two specially selected shoots, one on either side of the main stem and about 25cm from ground level. To accomplish this the maiden tree, if feathers are available at the level required, is cut back to them and the feathers themselves shortened by two-thirds. All other feathers are removed. Maidens not suitably feathered are cut at about 40cm above ground. From the ensuing growths, two suitably placed strong shoots are selected, one on either side, and are trained by supporting bamboos at approximately 30º to the ground. All other growths are cut back to two buds, any very strong ones being removed completely; once the two chosen shoots are safely established, the remainder too can be pruned off. The following spring the two established shoots must be shortened to one-third of their length and from each should be trained an extension shoot, one shoot underneath and two above, all being trained out fan-wise. Any surplus shoots are again initially shortened and then removed once the selected shoots have been safely trained in. The latter are all shortened by one-third in early spring and further new shoots developed from them later. In this way the initially empty centre of the fan is gradually filled in. This method of training the fan is to be preferred to using a central stem with shoots radiating from it, because unless training is meticulous, vigorous growth at the top of this central stem will begin to overshadow lower portions of the tree. Pruning established trees should always be done during the summer when the risk of infection from silver leaf is less. Early summer is ideal, while fruitlets are still small, and all wounds over 2.5cm in diameter should be sealed immediately with a suitable paint. On bush trees and spindles pruning consists of removing any low, crowded, crossing or damaged growths or branches keeping the number of cuts to a minimum. On pyramids and fans, shortening of all new shoots once hardened at the base should be done annually. On the pyramid, summer-pruning continues as outlined under formative pruning, while for fans shoots are shortened to three leaves from their base, with any excessively vigorous or surplus growths pinched out as soon as noticed. Plums require adequate levels of nitrogen and potash and occasional applications of phosphate. Sulphate of ammonia at 25g/m² in spring (or nitro-chalk at the same rate where pH is below 6.0) and sulphate of potash in late winter at the same rate every other year are typical requirements. However, where growth is strong, nitrogen should be withheld. Applications of superphosphate at 75g/m² every 3-4 years are also desirable. Occasional mulching in early spring with farmyard manure is also beneficial where practicable. Watering is advantageous, coupled with adequate mulching, and may be essential in drier, hotter regions of Australia, South Africa and the US. Fruit-thinning is essential when a good set has occurred, but should be delayed until stoning has taken place – the development of the embryo stone confirms that pollination has been successful. (It should be noted that and apparently good set manifested by a mass of small fruitlets can abort within 2-3 days following unsuccessful pollination; the minute fruitlets turn yellow and drop.) Thin the fruitlets in late summer to 10-15cm apart with a pair of scissors. Remaining fruits will attain excellent size and branch breakages will be reduced to a minimum. Spraying the flowers or fruitlets with certain chemicals for fruit thinning in commercial orchards has so far met with mixed success due to varying conditions from one year to the next. Fruit should be gathered firm ripe, preferably picking a tree over two or three times for dessert samples rather than clearing the whole crop. Any broken branches should be pruned off as soon as seen and the wound painted. Propagation is normally by budding in late summer/early autumn. Grafting is an alternative and is favoured in Japan, but is not usually as acceptable or easy as for apple due to possible infection with silver leaf disease. Plums and damsons can be affected by several diseases which attack Prunus subspecies and other trees including armillaria root rot (Armillaria subspecies), bacterial canker and shot hole (Pseudomonas morsprunorum), brown rot and blossom wilt (Sclerotinia fructigena and Sclerotinia laxa), crown gall (Agrobacterium tumefaciens), fly speck (Schizothyrium pomii), powdery mildew (Podosphaera tridactyla), scab (Fusicladium carpophilum), sooty blotch (Goeodes pomigena) and silver leaf (Chondrostereum purpureum). Plum rust, Tranzschelia pruni-spindsae variety discolor, causes yellow spots on the upper leaf surfaces; the orange-brown urediospores and later the darker coloured teliospores are produced underneath the leaves. Victoria plums are particularly prone to infection. Anemone species are an alternate host for this fungus and aeciospores are produced on the lower surfaces of their leaves. Pocket plums is a disease caused by the fungus Taphrina pruni in which the fruit is malformed and lacks a stone; Taphrina institiae causes witches’ brooms. 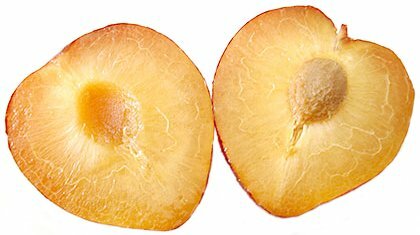 Several virus diseases affect plums, the most important being Sharka disease caused by the plum pox virus: this produces pale spots and blotches on the leaves while the fruit, which is useless, shows uneven ripening and dark bands and rings in the flesh. To avoid the disease, certified virus-free plants should be obtained and the aphid vector, Myzus persiicae, needs to be controlled. The most important European pest of plums and damsons are aphids including the leaf-curling plum aphid (Brachycaudus helichrysi), the damson-hop aphid (Phorodon humuli) and the mealy plum aphid (Hyalopterus pruni), which also occurs in North America; larvae of the plum sawfly (Hoplocampa flava) which tunnel into fruits at the fruitlet stage; caterpillars of the plum fruit moth (Cydia funebrana), which are pink and red and up to 15mm long, bore into ripening fruits; the defoliating caterpillars of various subspecies of winter moths; the magpie moth (Abraxus grossulariata); and the fruit tree red spider mite (Panonychus ulmi). Both winter moth and the fruit tree red spider mite also occur in North America. Plums may also be attacked by capsid bugs, some scale insects, and wasps and birds which damage the fruits. In North America the trees may become infested with the rusty palm aphid (Hysteroneura setarcae); by the plum curculio (Conotrachelus nenuphar), a weevil with spring and autumn foliage-feeding adults and white legless larvae that feed on ripening fruits; and by caterpillars of the oriental fruit moth (Grapholitha molesta), which tunnel into shoot tips and later invade the fruits.